Socks have boomed in the past few years, with good reason. They make us look, laugh and think. We can shop for a cause, a mood, a temperature or a budget. And if you want to make a statement they’re quicker to change than bar tape. International fashion police UCI were onto socks early of course, regulating sock height in the name of limiting performance gains from compression in 2012. While the ruling met with derision, I am grateful for its sartorial effect. And it did serve to mark the UCI as employer of choice for fashionistas like Britain’s Brian Cookson. He’s now on the case of other big issues in cycling so a minimum wage for pro women might have to wait. I don’t care quite as much about sock height as the UCI, or some roadies. But then the average roadie is way taller than me and a bloke, and there’s the rub. Sock heights evolved in the men’s peloton, not women’s, so they warrant critical inspection beyond the furtive form check in plate glass windows. And being men’s rules, I’m invoking latitude (in lieu of altitude) anyway. But there are also practicalities. The Velominati aren’t prescriptive and leave it at Goldilocks length – not too short and not too long – while many Beach Roadies err on the side of longer. Nudging the calf (NTC) is common and works perfectly as a unisex description, but the cuff height doesn’t. 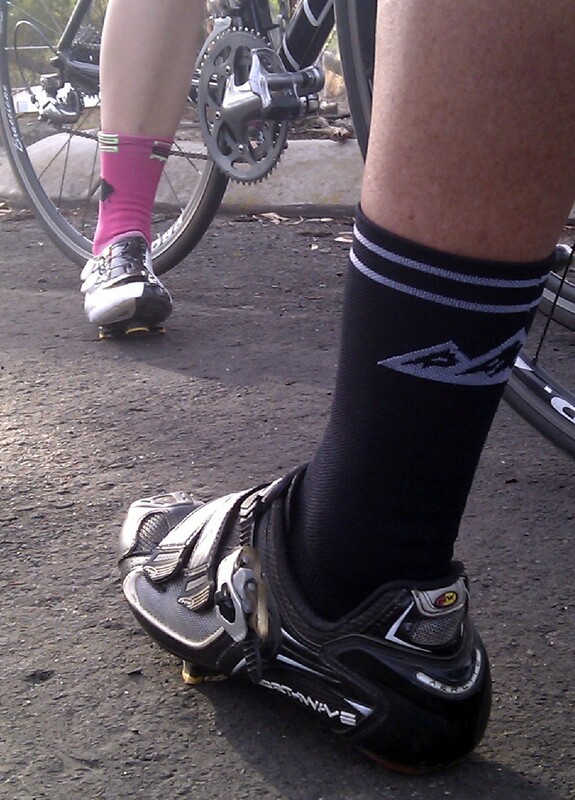 An NTC cuff on a 190 cm foot roadie is mid calf on some women. And in capri knicks, NTC roadie cuffs barely leave a sliver of skin in between. So some socks, and some of the more exciting ones, are just too tall for women. There’s also the question of pro length. Most of the pros pictured below are way short of NTC. Many women also prefer low/no-show cuffs in the name of tan lines, whatever their height. And before anyone scoffs at tan lines or gets Brian Cookson on the case, think back to Robbie McEwen tucking up jersey sleeves in summers past. Thoroughly Pro. Sigh. There’s also the sock-height effect on leg length, especially among commuters. Picture stopped at the lights, possibly in a skirt (kilt is acceptable too). You could go Foot-firmly-planted-and-straddling-the-top tube, the steadier businesslike option. Or for an extra few inches of leg length, Delicately-balanced-on-one toe. While height can therefore be variable, comfort is non-negotiable, for me at least. A toe ridge seam is a deal-breaker. Mid-band support is fine, and I love a generous toe for wriggle room. But the true bliss of cycling socks is the relaxed cuff. Surely all socks should adopt cycling’s lead. In winter it’s about warmth of course; I know an enduro mtbr who only races in Assos early winter socks, commuters who swear by Humphrey Law’s Aussie wool blend and one NRS woman who has apparently never set foot in anything but Assos. Ever. My frosty toes have never been happier than this winter after discovering Assos’ fugu socks. They’re long enough for a roadie and woolly enough for a gravel grinder but so warm and plush under foot that I’m in love. For cool weather touring, the fugu would be my first choice – for now. At slightly warmer temperatures I’m still partial to Santini’s winter sock, a mix of wool, Prima Loft and a generous dose of elastane. They’re thin enough for my road shoes and short enough for capris. And they’re good for many days without a wash if you’re touring. I just want something cheekier. For a long day in summer, my favourites are wearing out so I’ll be experimenting again with this season’s offerings. It’s getting to be a large sock drawer. Fortunately the UCI hasn’t regulated style so the past few years have seen some great local socks, in addition to the world brands. There’s still some fluoro around but there’s any number of colourful offerings. 4Shaw and Sydney’s Attaquer always offer something strong, and new brand maapapparel has launched socks ahead of the rest of the kit in October. Barnaby has great design but they seem big. Unless you’re bloke-sized. See? Socks also mark tribes of course; a secret handshake on the road or wink at the cafe. If you see a cloudburst or some hills (right), think carefully before challenging on a climb. You might just find you’re 7000m short at the end of the day. I watched four roadies chicked by those pink ones on Donna Buang one day; I’m guessing one is scarred to this day. So here’s to a summer of fabulous socks. To rebels flirting with the rules, die-hards who wont – and women who can do whatever the hell we please. There’s nothing more pro than podium length on a world champ. Black socks at 2014 Bay Crits, and now with a U23 Worlds silver medal. Oh dear. Those desert boots again. 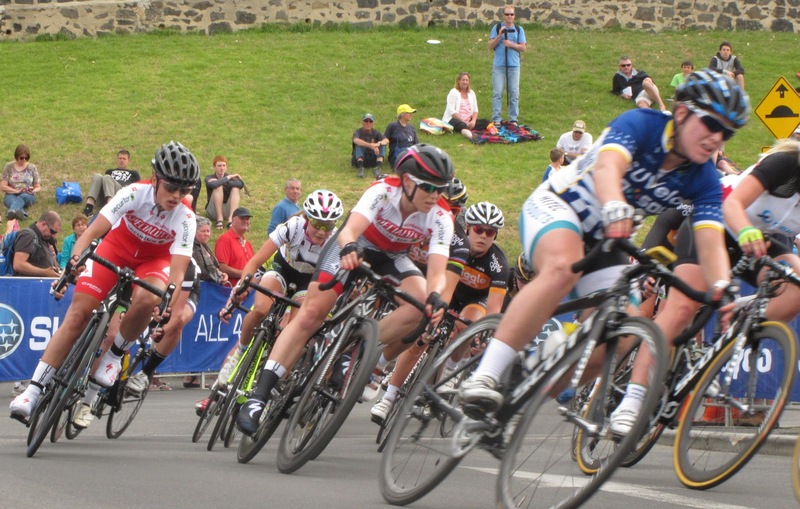 This entry was posted in Cycling, Racing, Women's cycling and tagged #MelbourneCycling, cycling style, women's cycling, women's racing by quaddess. Bookmark the permalink. 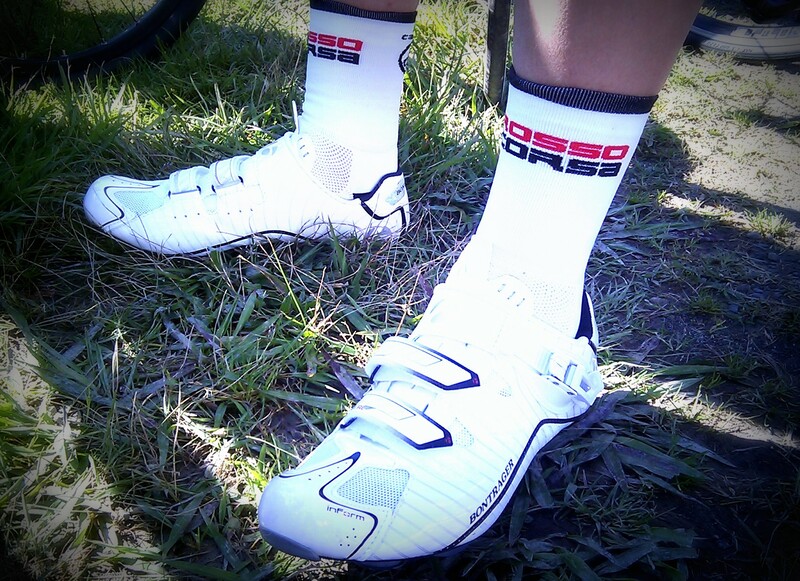 Some great cycling sock photos you have!